The Forest of Illusion is a convoluted maze of paths and levels. If you just go to the straight path, you will simply go into circles. You will need to find the secret exits if you want to get out of this area - and there are lots of secret exits in this world. There are two paths that lead out of the area. 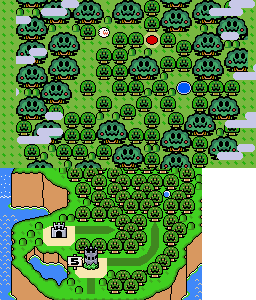 One leads to Roy's Castle, which in turn leads to the next world. The other path leads to the fortress, and beating it enables another uplink to Star Road. This page was last edited on 8 August 2013, at 09:18.